Tra La La! It’s Origami Captain Underpants!! 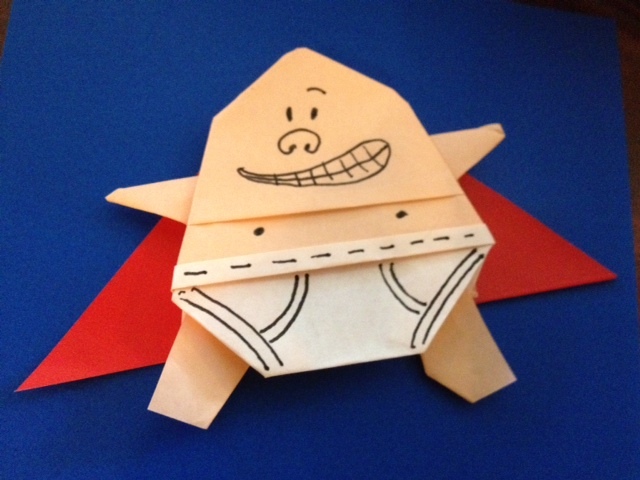 I may get to meet Dav Pilkey this weekend… So I made this origami Captain Underpants to give to him. It’s sort of a combination of the simple Yoda and Santa folds. Hahaha!!! I am chuckling as I post this! tra-la-stooky to the plastic dinosaurs tom! i got some foldin’ to do! Make origami talking toilets from book two! Not only is that really good, but it reminds me so much of back when I was in Grade 1, reading those books. Dav Pilkey has made two Captain Underpants spinoffs, but we’ve heard no news about the next mainstream book, which is why no first graders are currently reading Captain Underpants. But there will be a Captain Underpants movie very soon (Google it), so I might watch that to bring back more memories. Same here about the grade 1 thing. No affence but Origami Yoda is such a boy thing! TWO OF MY FAVORITE THINGS COMBINED! I love Dav Pilkey! His new Captain Underpants book comes out tomorrow after a 6 year hiatus! POST INSTRUX PLEASE!!!!!!! Wow! Right after I complained that his book isn’t being released (I knew that it was on hiatus), you revealed that it’s being released tommorow! Cool! Can you post exsact instrux! Please!!!! Can you get a digital autograph for me? That brings me back…. I had and read the first eight in kindergarten and now my little bro Zach ( Tom you met him in Nashville, you signed his yoda) is done with ’em all he axciously waits for the next one…. He’s working on the lesser known Ricky Ricoda series by Dav Pilkey. I used to read Ricky Ricotta too! Guys my bro got the new one today and it said the release date for the tenth and final book! Captain Underpants and the Revolting Revenge of the Radioactive Robo-Boxers! Coming January 15, 2013! Is it sad that I’m in 9th grade and still read those books? No I’m in sixth and just finished the new one I still laugh at all the jokes! It’s not sad, at my old elementary school, they banned the books for anyone under 5th grade. Even though I was in fourth grade, I posed as a 5th grader to get the books though. When I was in 5th grade I didn’t have to pose though. i figured out instructions for it it looks just like it! You combine Santa and Yoda and you get………. Captain Underpants?! What do you mean “Santa folds”?